Rising demand and scarcity of properties for sale have pushed up land values sky-high. If you had bought a patch of land in one of the country’s high-end residential villages in 2010, its value would have likely more than tripled by now. Check out the infographic below to see how much land values have grown in these villages in the past six-and-a-half years. Dasmariñas Village in Makati had the most expensive land in the group, with land values averaging at P300,000 per square meter. 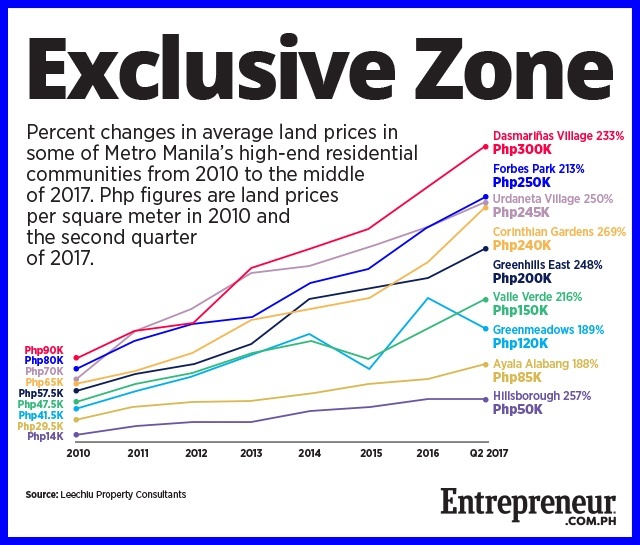 Two other high-end Makati villages followed: Forbes Park at P250,000 per square meter and Urdaneta Village at P245,000 per square meter.